First the good news, by the time we get to the 2014 Georgia-Florida game, the world's largest video scoreboards will be in place in both the South and North end zones, not to mention many more video boards and screens around the stadium. That is a win. There are places in the stadium that you just about have to twist yourself out of shape to find an out of town score or see stats. There will also be pools and other activities to entertain attendees. Think the pirate ship area at Tampa's Raymond James Stadium. All these seats are going away. Now, the bad news: They are taking 7000 seats from the North End zone to make this happen. While the release mentioned the ability to add in seats for certain high capacity events, there is no way they can add back 7000 seats. As it is, those seats in the South end zone only add about 4500 seats. As it is, the Jaguars' capacity will be reduced by about 2000 seats, taking into account those seats in the North end zone that aren't available due to tarps over them to help reduce TV blackouts. 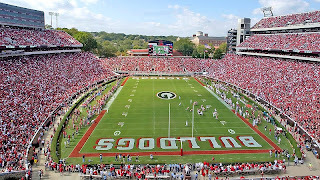 Look for the new capacity for Georgia-Florida to drop from around 84,000 to 81,500. If they go with this concept, there will be a limited number of seats in the North end zone that will be under cover. This is a win for Jaguar fans. The reduced capacity means fewer TV blackouts. The increased fan amenities gives a bigger reason to watch Blane Gabbert throw passes behind receivers or run for his life. Shahid Kahn's personal financial commitment to this speaks about his plans for keeping the team in Jacksonville. The losers are folks who have marginal priories in Georgia and Florida's respective ticket contribution funds. Reduced seating could come into play when the next WLOCP contract comes up for renewal. The Wife mentioned the same thing, but Jacksonville, as long as this game is relevant, will do what it takes to keep the game there. As long as the City strokes a check or more than we can make in profit at home we are staying there. No matter the capacity. Should read "for more" not "or more"
FWIW, McGarity has been promised that there will be no reduction in capacity for GA-Fla, according to ABH.